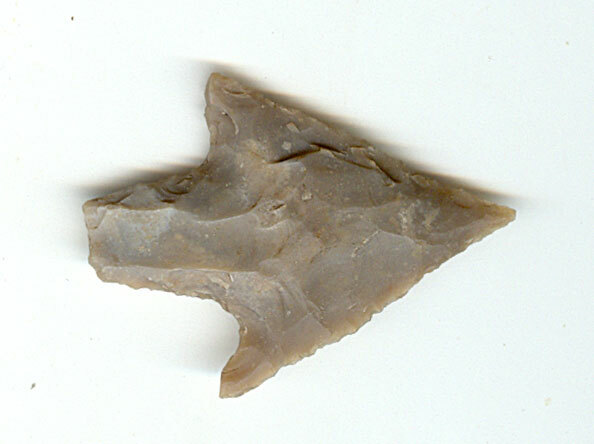 A Medium Size, Thin, Well Made, Langtry Point That Exhibits Stone Sheen & Surface Aging Coloration Patina, Aged Caliche Surface Deposits, Correct Blade Sharpening Reduction, Mineral Deposits, Correct Basal Configuration, Correct Style Blade Flaking, Deep Hinge Aged Staining, Correct Material & Manufacture For The Area Found. Ex-Fred Eiserman & Jim Bennett Collections. Several Sharpening Has Reduced The Length And Width Considerably. This Is A Highly Collectable Artifact! Includes A Ken Partain Certificate Of Authenticity!